The noodles are in the bowl in an aged mushroom broth. 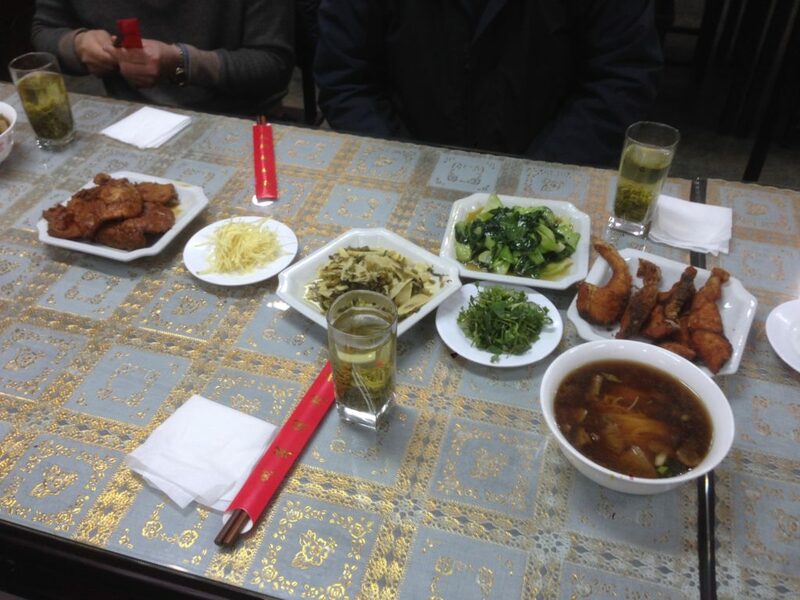 The other stuff you see, from left to right, are pork chop, ginger strips, bamboo shoots, veggies, and smoked fish. All of these are supposed to be thrown on top of the noodles before consumption. As for the tea? Local Yushan green tea, which is not exactly the most elegant thing on Earth, is rather sweet, and goes down really well with local noodle breakfast. When I first drank the tea, it’s the typical Yushan green tea taste. After the noodles, though, it actually got sweeter – partly because it’s a bit more diluted now, having been refilled with water, but partly also because I just had a bowl of noodles. Food, of course, changes how you perceive your tea, which is why I normally don’t eat snacks when I drink tea. When you drink a lot of tea gongfu style, it is easy to forget that there is a world of people, in fact, the majority of drinkers in China, who drink green tea day in, day out. Tea is also mostly drunk with meals, and a really strong, bitter tea doesn’t often go well with a lot of food. On the other hand, green tea, with its refreshing and sweet taste (if it’s good, anyway) goes down great with a lot of foods. This is especially true if the local cuisine is a little heavier in taste. In Guangdong, where the local cuisine is more delicate, a stronger tea (like cooked puerh) might actually contrast well with the food. Food and tea pairing is definitely something people should start working on, although I think it is not easy to do – mostly because of the problems of preparation (what do you do when you’re halfway into a meal – rebrew new tea? You can have some serious caffeine problems that way). Maybe someone should think about how to resolve these issues. Traveling with tea is important, lest you have to resort to desperate measures like drinking McDonald’s teabags. 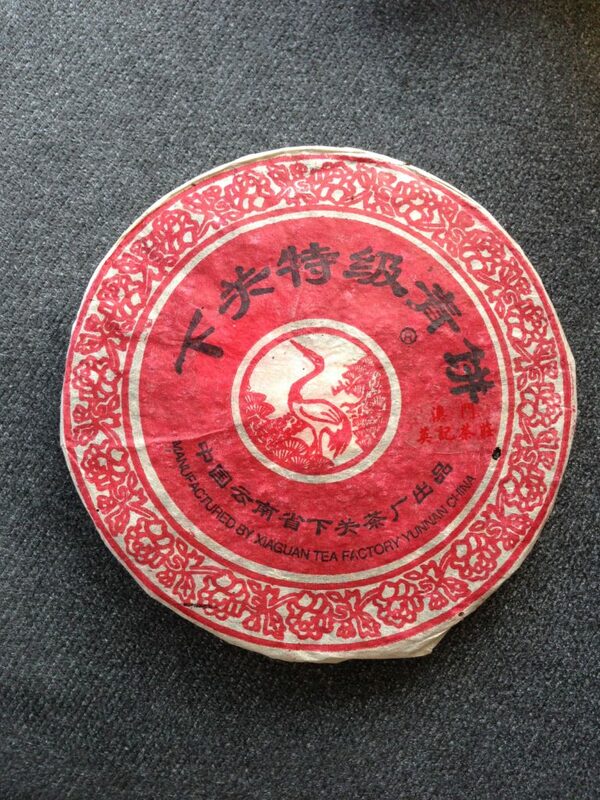 When I am on the road these days I usually bring one of my early 2000s puerh with me, because 1) puerh is made for traveling and 2) they taste great when drunk grandpa style, which is really the only way that is practical when on the road. I tend to know these teas well, so it’s always fun when you go to a different place, and you brew a cup, and the tea tastes different. The only difference, other than not having my usual mug or what not, is the water. Specifically, it’s the tap water. I still remember when I first went to college in the great state of Ohio, and tasting the water there at the school, I wondered if I was drinking from some horrible swimming pool. I promptly bought a Brita, which didn’t do a lot other than removing some of that chlorine taste. It was horrid, and remains, to this day, some of the worst tap water I have had access to. These days I normally drink tea using Hong Kong tap water, which is a mixture of local reservoirs and river water from the East river in Guangdong, not exactly known for great water quality. The result is ok, but certainly not great. So being here in Vancouver BC, where the tap water quality is great, comes as quite a nice change of scenery. The water here is a combination of lakes, creeks, and snow melt. It’s got a typical low mineral content taste, crisp, cold, and somewhat light in body. Drinking my Menghai tuo with this water makes the tea more floral – the “green” notes are far more present here than when I drink them in Hong Kong. My pet theory is that water with higher (but not too high) mineral content actually somehow manages to pull more “stuff” out of the tea than water with very low mineral content. The result is that lower mineral content water actually means more infusions for the same tea, at the cost of thickness/fullness in taste. It is also a good reality check for a tea that you drink often – recalibrating your expectations with regards to a tea that you think you know well already. This is easily achievable without having to fly 10 hours to a new city – the many kinds of bottled waters out there can do that for you. For a good all-rounder that is available everywhere, Volvic is always a good option for tea. For those seeking lighter water, something from Iceland, with their glacier melt source, tend to provide a nice, crisp experience. Putting your own tap water in that spectrum helps situate where your water source is, and thus helping you figure out the most important ingredient in your teamaking other than the leaves. It’s a useful exercise and something that I recommend everyone to do every so often. Despite its historical roots as an important trading post for tea, the Hong Kong of today is not that friendly towards teashops and the tea buying public. There is a lot of tea around – you encounter the drink everywhere. The default drink at a lot of places is weak, watered down tea. The favourite drink to order at a local restaurant is Hong Kong style milk tea. You can’t avoid the stuff. Yet, if you want a more “refined” experience drinking tea, or if you want tea that can be considered more specialized, this isn’t a friendly place. The chief enemy here is really one that plagues the city for almost everything – high rent. The lack of land, the influx if large number of mainland tourists, and the sheer density of the city mean that every store front is precious. In a city that has always been built vertically to the extent that is possible given whatever current technology we possess, street-level stores are a precious commodity. When you stroll down some of the busiest shopping areas, you will see rows and rows of jewelry shops, luxury clothing stores, and pharmacies that cater to the mainland trade. Shops that cater to local needs are usually relegated to back streets and residential neighbourhoods. It’s a very strange sight. In this context, it is very difficult for stores specializing in selling tea to survive. The first challenge is to overcome the rental market. Owners of stores often charge exorbitant rents for very small spaces if they happen to occupy good locations. Some even charge rent according to the amount of turnover the store does – so the more money the store makes, the more money the landlord makes. Unfortunately, tea businesses in general aren’t going to be that popular. There are really two paths to survival – one is to lower costs as much as possible, the other is to charge sky high profit margins to make the rent. So for the cheap side, there are a few ways to do that. The first is to somehow own your own store – a number of older stores in Hong Kong do that, and are therefore impervious to rent increases. A lot of the shops on Bonham Strand, for example, are in this model. They bought their place fifty years ago, and aren’t looking to move. They make a decent living selling tea, and are happy doing it instead of, say, closing shop and renting it out to a fancy new restaurant. So they keep up their business and sell decent tea for cheap. They are, however, probably not profit-maximizing and shops like this are prone to closing when the older owners pass it on to their descendants. The other option is to “go upstairs”, where the shops no longer operate on the ground floor, but move to a building inside. These are usually located in cheaper, older buildings, where they occupy what is basically an office space but renovated to be a teashop. Rents for these are much lower, and can often be supported by a small tea business. There are now a number of these in operation. I just visited one recently, called the House of Moments, where I took the above picture. The tea was all right, but it was rather expensive for what it was ($30 USD for an ounce of Taiwan roasted TGY). You pay for the space you occupy basically, and in Hong Kong, space is expensive. The other option, which is to charge high margins, is really geared towards the gift/tourist trade. The Best Tea House has increasingly gone that way in recent years. There’s Fook Ming Tong, which is also just an expensive gift shop that happens to sell tea. Then there are things like TWG Tea, which shamelessly puts 1837 on their logo even though the company was founded in 2008, and whose colour scheme is an obvious attempt at ripping off Mariage Freres (whose 1854 on the logo is at least real). They usually occupy nice malls and have prominent displays. These places are really to be avoided by those of us who really want to buy decent tea – only visit if you want something with decent packaging. It’s really rather unfortunate, but given the local infrastructure, there isn’t much that could be done. There’s a reason Taiwan has a relatively thriving tea scene – it’s cheap to set up a good shop and cheap to keep it running, where in Hong Kong it’s the opposite. If you were an alien visiting the city you’d think we all eat gold here, but in fact, it’s a place where small businesses have a hard time surviving. If you want to buy good tea when you’re in Hong Kong, visit Bonham Strand to try your luck. Otherwise, just skip right on ahead to somewhere else. Normally when I travel overseas, I bring my own tea. This way I have an assured supply of decent tea, so long as I can find hot water. On my most recent trip, however, I decided to not bother and see what happens. Granted, I was going to Japan, so things are a little easier in that it’s a tea drinking country. I know I’ll be able to find tea here and there. With a one year old in tow, it’s just easier to travel with as little as possible. It also ended up being a good look at how normal people can consume tea. I think doing this across many countries can also tell you, generally, how much tea that place drinks. In Japan’s case, the answer is obviously a lot. The kinds of tea that I ended up drinking include a large number of bottled teas – from cheap roasted oolong to sencha ones, bought from vending machines or in some cases convenience stores. I consumed a number of hotel teabags, which include a Lipton Darjeeling (doesn’t taste like anything from Darjeeling), a Lipton Ceylon (what you’d expect), some unbranded oolong tea (cheap Chinese restaurant tea) and some unbranded sencha (meh). 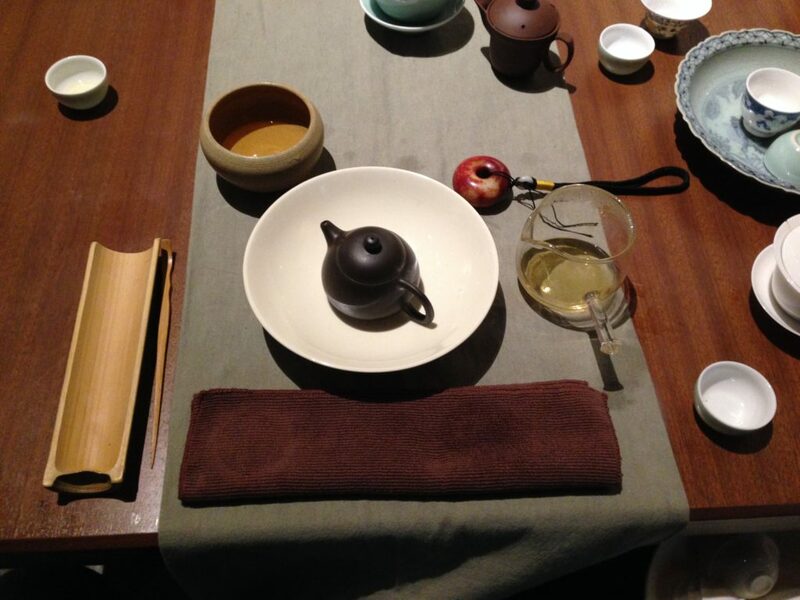 At various restaurants tea is offered as a matter of course, with hojicha being the most likely beverage given. Which is a basic sencha kit. You can see the kyusu is cheap, but if you’re going to let regular guests use it, it’s probably wise to use cheap kyusus. 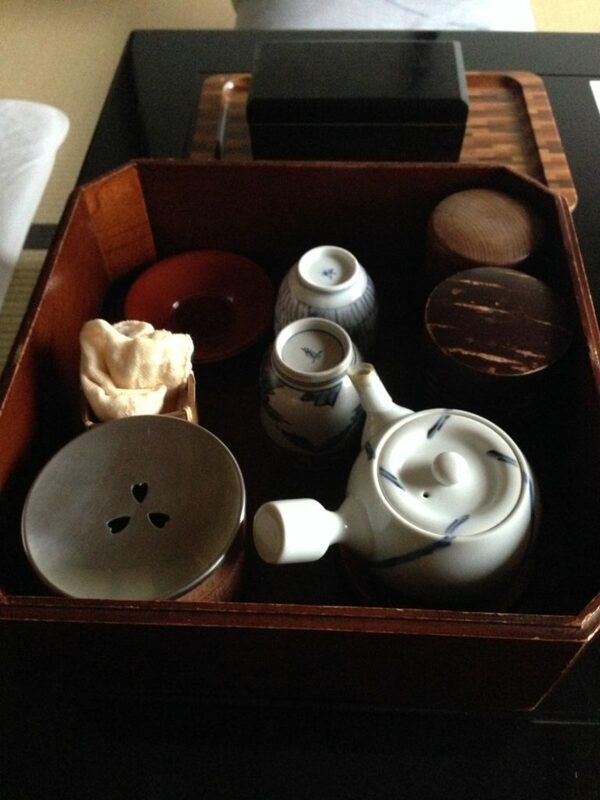 It has everything you need – two cups (more if there were more guests, I believe), a pot, a water container, two chataku, a towel, and two types of tea – a sencha and a hojicha. The sencha is bagged, while the hojicha is not. I suspect it mostly has to do with the fact that the sencha was going to be difficult to clean out of the kyusu so they bagged it for convenience. The teas are actually decent quality. Now, this is all in a country that produces a large amount of tea, where every hotel room has a water kettle, and generally is friendly to tea drinkers. If I had brought my own tea, I would’ve just drunk those plus maybe some bottles, which is not too bad. Contrast that with Korea, though, and you can see that Korea, in general, is not a tea friendly place. Hotel rooms at two pretty decent hotels have no provision for good hot water – you need to either use the coffee machine, which is mostly a horrible idea, or you ask the hotel to bring hot water to you, which they do but in carafes that have carried coffee before, thus defeating the purpose of asking for water in the first place. Restaurants do not routinely offer caffeinated tea as a beverage. I brought my own tea there, but it was a frustrating experience. Your best bet is to go to the nearest coffee shop and buy that anonymous black tea they have. It’s a much sadder place for a tea drinker. It’s at more or less the same level as traveling to the US. Koreans drink coffee. From my experience, if you’re not happy drinking anonymous bagged black tea all day long from paper cups, only Japan and Taiwan are safe places to travel without any tea of your own. Even mainland China is dicey – you need to hit tourist spots to find those tea stands that sell you cheap but decent green teas. Although at least in China, good hot water is to be had everywhere, so bringing your own is made much easier. So let’s say you settled on a tea store and you’re about to go in. What then? First of all – if a shop already has some patrons in there, and I don’t know the shop owner already, I don’t go in. There is no rule that says you can’t walk into a store with customers, but generally, unless it’s a big store with more than one tea table and more than one free storekeep, I’d avoid those and wait for them to clear. If you can invest multiple visits to the same market, then by all means go in and get to know them, but if this is your only visit, it’s usually not a great idea. For the purpose of “what to do” there are really two kinds of shops that we’re talking about. There are puerh shops, and there are everything else. 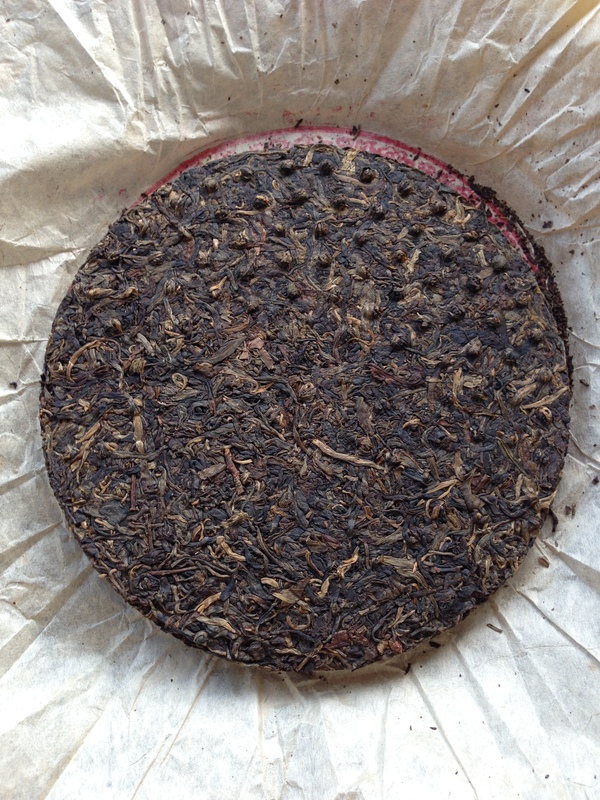 Puerh shops – These are relatively simple. The reason is because the teas they sell are all on display – they are usually part of the wall decoration, so you know exactly what the shop sells. There are shops that only sell a single maker’s cakes, and there are shops that sell from a variety of makers. Either way – you know what you see in front of you, assuming you can read Chinese, and you can just point and say I want to try this, or at least look at it. For stores that refuse to give you an opportunity to try a tea, unless said tea is in the extremely expensive (i.e. 3000 RMB or above per cake) territory, you should probably just walk out now. Of course, walking in and demanding to try an expensive cake right away may rub people the wrong way as they might think you’re just mooching tea off them, so some diplomacy is usually useful here. I’ve said before that it is sometimes useful to demonstrate that you’re not a complete neophyte when it comes to buying puerh. Being able to wrap a cake properly helps that, as is sounding somewhat knowledgeable. However, that’s not necessarily that useful. Unfortunately, it comes down to tasting. There is always going to be a bit of song and dance when it comes to trying new cakes with a new store – the owner is trying to figure out what you like, you’re trying to figure out what the tea is like (and the owner too). Sometimes it doesn’t work and you just have to bail and go somewhere else. Sometimes you get to engage a bit more. It kinda depends. Remember though – you have a lot of tea stores around you and you’re not at a loss for options. If the first place you picked end up pushing terrible teas on you, or keep insisting you should drink cooked when you want raw, go somewhere else. Picking the right tea in the store to try is always hard, and is made a bit easier if you read Chinese. Picking something that will radio your interests to the owner is useful. If you are interested in big factory teas, choose one of those. If you want something from a smaller outfit, do that. If you want Yiwu, ask them what Yiwu you have. These are also ways in which you can show you know more than nothing. Non-puerh shops – These are infinitely harder. The first problem is you can no longer see what’s on offer. Assuming you took my advice and walked into a store that only sells one type of tea, say, yancha, you know that the vast majority of the teas they have are yancha (they might dabble in a few things on the side, but that’s usually not advertised). The problem is, they have all these cans, or boxes, or whatever they choose to contain their teas in. There are labels on them, but by and large, labels on boxes or cans in Chinese tea shops have nothing to do with their actual contents. In a giant cardboard box with the words “Dahongpao” on it, for example, you might find smaller bags of tea of various sizes. Only the owner knows what they are. So your only way to get to try whatever it is is to ask. A very common question that an owner would ask you, once you tell them you want to try some yancha, is some variation of “what price range are you looking at?” This is the single most annoying question in the entire tea tasting process at a tea shop in China. It’s difficult to answer. Telling them a high number basically tells them you’re there to be skinned alive. Telling them a low number might mean time wasted drinking crap. It’s also a place where they can easily manipulate the teas they show you to get you to pay what they want you to pay. One way perhaps to circumvent that is to first ask to look at multiple teas. Learning how to judge teas by look, at least a little, is useful here. Unfortunately there’s no hard and fast way to learn how to do that – and some teas can look ok and taste like garbage. After you looked at a few, try the one that looks the most promising. There are a number of things they can do to sell you the tea they want to sell. By starting you off with a bad tea, for example, the next thing you taste will be amazing, even when it’s actually just an ok tea. They can also do it the other way – show you something that’s ok, then a bunch of stuff that’s no good. After the third one you’d give up and buy the first, even though it’s entirely possible you’d find much better tea next door, or they have even better stuff that they haven’t shown you. Prices is also a problem – three teas that they are willing to sell you at, say, 300, 400, and 500 a jin can also be sold at 1300, 1400, 1500 a jin, and you wouldn’t know the difference unless you know what a tea that sells for 1500 should generally taste like. 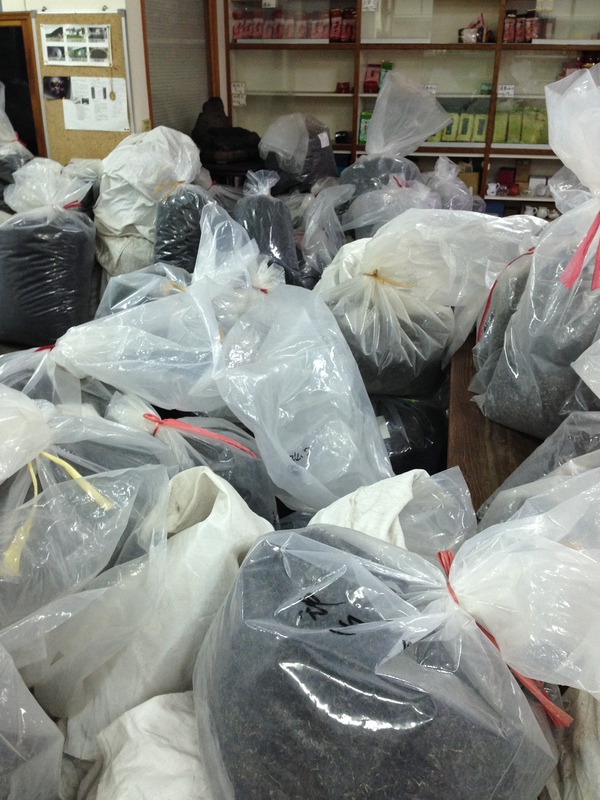 Shopping for good loose tea is not easy and is a lot tougher than shopping for puerh. It takes real practice. More on teashops and tastings next time. Traveling to China soon? Want to buy some tea for yourself or someone else? I thought I should do a guide on what to do when you’re in China and looking for tea. Note: things I say here do NOT apply to Hong Kong or Taiwan. China’s commercial landscape for tea is pretty different from these two places and so they operate under separate rules. 1) Do you speak any Mandarin? 2) Are you buying for yourself? 3) Do you have a lot of time this trip? If the answer to any of these three questions is a “no,” especially if you answer “no” more than once, then the answer is easy – you should go shop at one of the big chain stores for tea, such as Wuyutai (state run) or Tianfu (Taiwanese owned tea conglomerate). Buy whatever suits your fancy there, and move on to do your tourist thingy. Before you say this is mercenary or too ismple – let me explain. If you don’t speak any Chinese, your likelihood of landing good tea at a local shop is pretty low. There might be some local specialty tea store that can deal with you in English, but your run of the mill tea shop on the street corner probably can’t. You may be able to get away with some sign language, but you need some luck and goodwill from the store owner to not get screwed in the process. Granted, even if you don’t speak Mandarin you can still go to see a tea market, just don’t expect any great bargains or a guaranteed positive experience doing it. If you’re not buying for yourself – it’s hard buying tea for friends. If your friend is so unkind as to stick you with a tea buying mission while you’re on your trip to China, especially if you yourself are not too keen on buying tea on the trip, well, they pretty much deserve whatever you find convenient. Also, places like Wuyutai or Tianfu won’t screw you with fake tea – they’ll just screw you with higher prices. 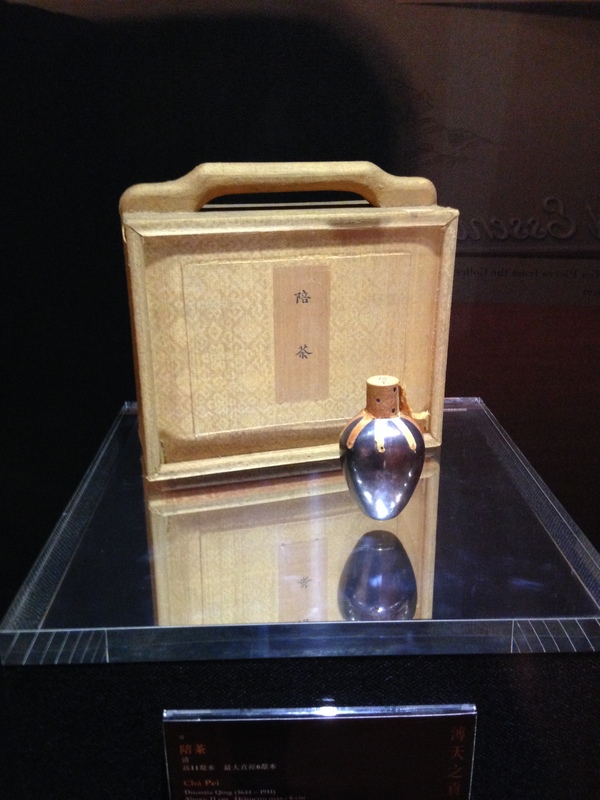 Lastly, the tea they sell will come in decent packaging, relatively speaking. This may be important if you’re buying a gift or for the unwashed who judge teas by their packaging materials. If you’re on a short trip and barely have time to fit in a visit to the Forbidden City, then wasting half a day just to get to a tea market is probably not the best idea. You can buy tea online from your own home, but you can’t visit sites online (not really anyway). Go do your touristy thing and ignore the tea. Now, if your answers to all three questions are “yes”, or if you feel adventurous enough and seeing a tea market is your idea of fun, then you should try to investigate what your city’s local tea mall is (there’s one in a lot of major cities). Some are pretty far from city center, while others are right inside the city. Big cities often have multiple markets. In Shanghai, for example, there’s the Tianshan tea market, which is not huge or great by Chinese standard, but it’s certainly more teashops than any visitor would’ve seen in person, and it’s very close to a subway station. There are also a lot of small, local teashops. These fall into two categories. One is the run-of-the-mill kind, which are basically your neighbourhood tea shop. They will sell regular stuff – often lower end. Prices are probably not bad here, although if you look like a foreigner it’s quite possible that they will give you a “foreigner special” and screw you in the process. If you just need some basic, no name tea, and if you don’t care about packaging or what not, these might not be bad options. These stores look grubby, basic, usually sparsely decorated, maybe just with some tea canisters on the sides, and not much else. The owner likely lives in the store as well with his family. There are now another kind of teashops – these are the high end stuff, and you’ll know it if you see it. They have nice decor, pretty sales girls, good looking teaware, and generally are trying to sell you “art” instead of “tea”. I’d personally stay away from all of these. They do sometimes offer nice tea, but they will never be a bargain. There is also a high likelihood that they’re merely dressing up very average tea as good and exclusive, and so you’re really no better off than just buying online. The decision to go to a tea market is a little more complicated than that. 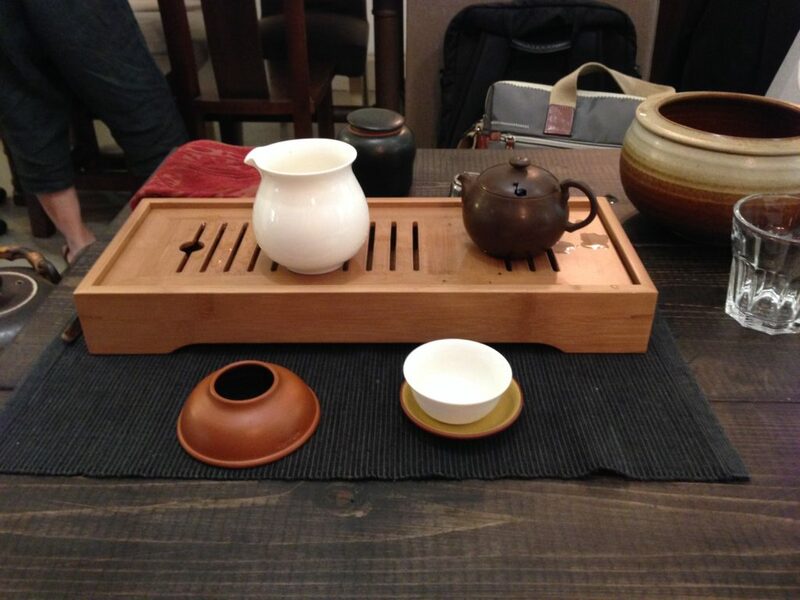 If you hate green tea, only drink puerh, and you’re in Shanghai, you are probably better off trying to see if Eugene of Tea Urchin wants to meet up with you instead. The thing is, puerh isn’t that popular in Shanghai, and while they will certainly have some at the tea markets, the selection will not be great, and prices may not be good either. If you are looking for green tea, you’ll have an endless supply there. If you want something not popular at the area you’re at, then it’s more of a crapshoot. If you go to a tea market though, there’s a secondary level of “where to go” that now enters the equation. You will be confronted by rows and rows of teashops. You only have a day, or half a day, or whatever. Where should you go? Which shop should you enter to spend your precious tea shopping time at? Obviously if you have something specific in mind, like a specialty store you read about, or a contact you made, then by all means go there. But if you are just visiting for the first time with no reference, then you should first consider what kind of tea you are interested in. You should almost always head into a store that only sells one kind of tea – if you want tieguanyin, look for a tieguanyin store. If you want white tea, try to find a white tea specialist. While this is by no means a guarantee that you’ll find great tea, it’s better than heading into one of the many generic stores that sell everything under the sun. To this end, learning what the characters for your favourite tea looks like could be useful, especially when you’re not looking for puerh. If you’re looking for puerh, stores that sell only one brand tend to have better stuff than stores that sell a hodgepodge of brands. However, stores that sell a hodgepodge are more likely to have bargains, provided you have time to find them and know what you’re doing. This usually require repeated visits. There is the same divide between high end store and grubby store at many tea markets. It is directly related to what your shopping experience will be like – whether it will be pleasant or not. This is hardly a good guage for quality though – grubby stores often can have very good tea, while a high end looking one can actually be selling inflated crap. So for these cases it’s really a matter of you being able to taste the difference. These are basically your options for buying tea in China. There’s never really any reason to buy from a department store or anything like that. I will cover what you do once you enter a store in another post. As many of you know, Macau is now the gambling capital of the world, having taken over Las Vegas for the number one spot a few years ago and now with a very sizable lead. I recently went, but not to gamble. One benefit to a city built on gaming revenue is that there often are things that are built around it because the city wants to attract tourists who (like me) don’t gamble – make them attractive enough so that their friends who might won’t get vetoed. Among these things in Macau, aside from the great food and the historical buildings, is a beautiful art museum. There’s a current show on teawares, with half of the items from the imperial palace, and the other half from the Victoria and Albert Museum in London. 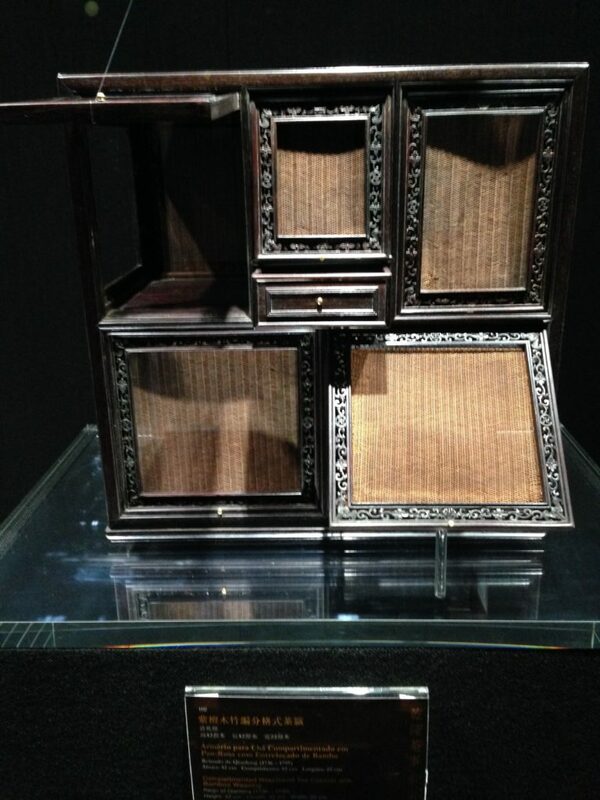 Some of the items there are stunning. There’s a supposed 150 years old ball of tribute puerh, a 400 years old yixing pot, and my favourite, a number of tea canisters for imperial use. I took a snap. This isn’t even for the highest grade of tribute tea, but rather the second highest. It’s not clear what’s actually inside though. Being emperor seems like a good idea. I did end up gambling a little – not by sitting at the blackjack table, but rather, buying some tea. There are a few older teashops in Macau in the more residential neighbourhoods. 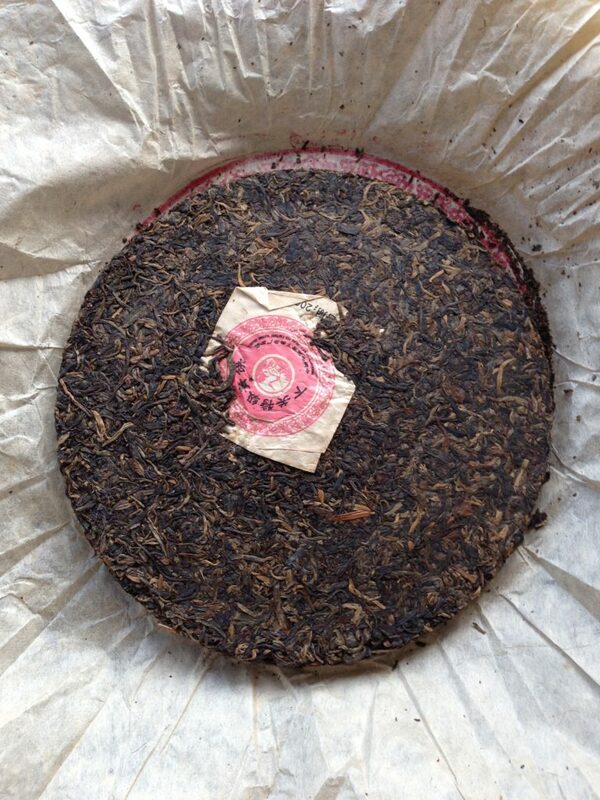 I ended up at one and bought a cake of what I think is 2003 Xiaguan. Not too expensive at all, and not too bad. Better than risking some scary looking thing on Taobao, although admittedly some of them are cheaper and maybe even better gambles. Then again, the store was so old looking and so run down, it was half the fun of shopping there. The female proprietor (I dealt with her husband) was sleeping on the bench in the shop, but covered herself in such a way that I didn’t even notice her until she woke up halfway through our exchange, giving me a bit of a startle. Who can beat that for excitement in a tea store? Anyway, if you ever come by Macau, I heartily recommend a visit to the museum. It’s certainly worth the trouble.